When you hear about an “accelerator,” you might think of an elite program in Silicon Valley focused on technology. But accelerators are opening across the country, helping promising entrepreneurs find success, and not just in the tech sector. Accelerator programs help small, young businesses grow quickly. Jeannette Balleza Collins, director of the ARK Challenge accelerator in Arkansas, says they’re like a highly selective business boot camp for early-stage, high-potential companies. Entrepreneurs apply to participate, and those accepted typically receive “seed investment at founder-friendly terms, industry mentorship and resources to help entrepreneurs gain additional customer and investment traction within a brief period of time,” she says. Programs usually run seasonally, and participants work in a cohort that starts and ends together, Collins says. 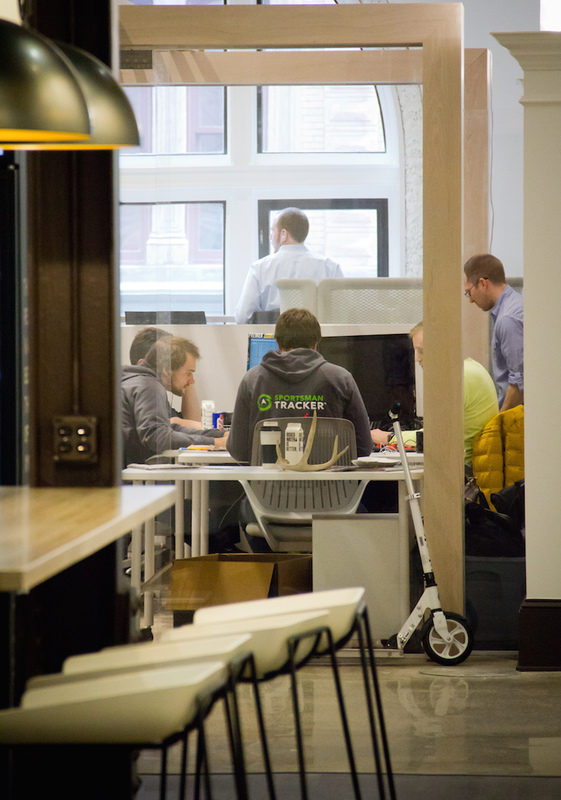 Participants work at the accelerator full-time and often enjoy valuable perks — anything from free co-working facilities to discounted web hosting and legal services (some perks come from Global Accelerator Network, which gives its stamp of approval and benefits to select accelerators). Accelerators conclude with a demo day, where entrepreneurs pitch to local business leaders, investors and venture capitalists. The programs also typically maintain an alumni network of graduated businesses that stay involved and sometimes even hire participants whose ventures don’t work out. Here are five of the most interesting accelerators in areas you’d least expect. 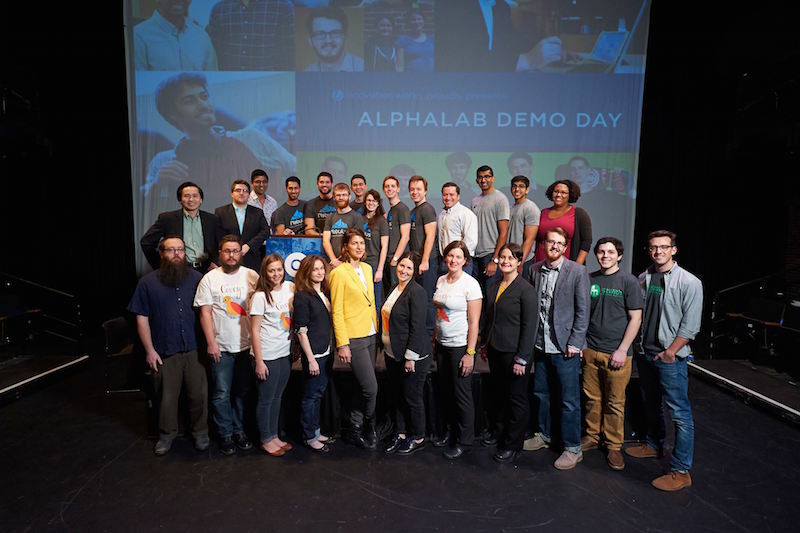 About AlphaLab: When it launched in 2008, AlphaLab was one of the country’s first accelerators. 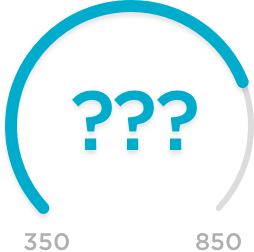 In 2013, it launched a second accelerator called AlphaLab Gear, for hardware and physical products. They take an average of six companies through an intensive program to achieve rapid growth through peer and mentor learning. Executive Director Jim Jen says AlphaLab aims to take companies from early stages — whether an idea or initial product — and get them to where they can raise funding, have a working product and achieve customer traction. This includes accelerating through basics of building a company; for example, they help companies incorporate and get legally set up correctly if needed. But most of the work entails helping businesses talk to customers and test ideas or prototypes to ensure their business adds value and targets the right people. “A lot of what we’re focused on is making sure the initial product or service really meets customer and market need,” Jen says. They help companies improve using rapid iteration, Jen says, which is “the idea of having a version of the product and testing with customers, getting that feedback and making quick changes to it.” Some businesses build what they think is the perfect product but don’t share it with customers until launch, when they find out they missed fundamentals, Jen explains. AlphaLab helps startups avoid this mistake and iterate until they nail it. Hitish Nathani (far right) from food truck Bombay Salsa Co. at Demo Day. Photo via GA Media. About Break Fast & Launch: Entrepreneurship resource center Cafe Commerce launched last summer in San Antonio as a partnership between the city and microlender LiftFund. As Cafe Commerce looked at its initial requests plus 20 years of LiftFund data, it noticed frequent requests for culinary help, says Ryan Salts, director of Break Fast & Launch. Around the same time, the SBA was running a competition to find new accelerator types nationwide. Cafe Commerce entered with a proposed culinary accelerator called Break Fast & Launch. Of 832 applicants, it was one of 50 selected. This victory brought funding, and in January 2015, it launched to serve Texan culinary entrepreneurs. Break Fast & Launch runs three accelerators in succession for different culinary businesses: food artisans and owners, beverage makers and sellers, and consumer packaged goods. “We take them through a gauntlet of challenges, things that come up as a new entrepreneurs, and help their business grow to higher revenues and profits,” Salts says. The first cohort of five food artisans just concluded; Salts says they all had diverse backgrounds, ranging from passionate home cooks to chefs from Michelin Star restaurants. 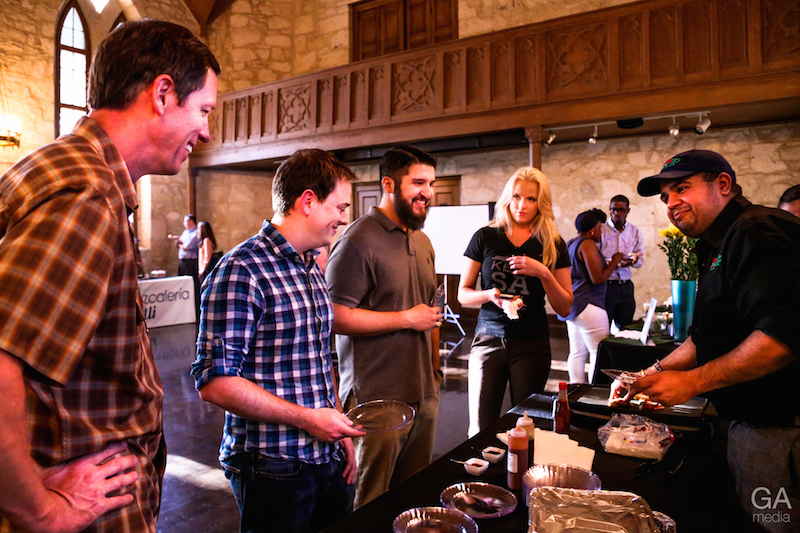 Financial investment isn’t available yet, but participants receive mentorship from top San Antonio food and beverage entrepreneurs, plus valuable benefits and resources to help young businesses grow. This includes thorough training on topics including business plan creation, accounting, real estate and marketing. Session on fundraising at NMotion. Successful graduates: Quantified Ag (wearable technology measuring cattle health), Mowdo (like Uber for lawn care), Fanstreamm (group ticketing platform for sports), Nobl Health (improves hourly rounds process). About NMotion: NMotion takes 5 to 10 new software startups per cohort and uses a mentor-driven model to help them succeed. Based in Lincoln, Nebraska, the 3-year-old accelerator sets itself apart by focusing on three vertical markets few others do: agriculture, sports and marketing technology. Managing director Brian Ardinger says NMotion is also unusual since it’s a nonprofit supported by private and public dollars (including University of Nebraska-Lincoln). He says this results in a very community-focused program, where local leaders and business owners rally around these entrepreneurs to provide the right resources and help them grow faster. 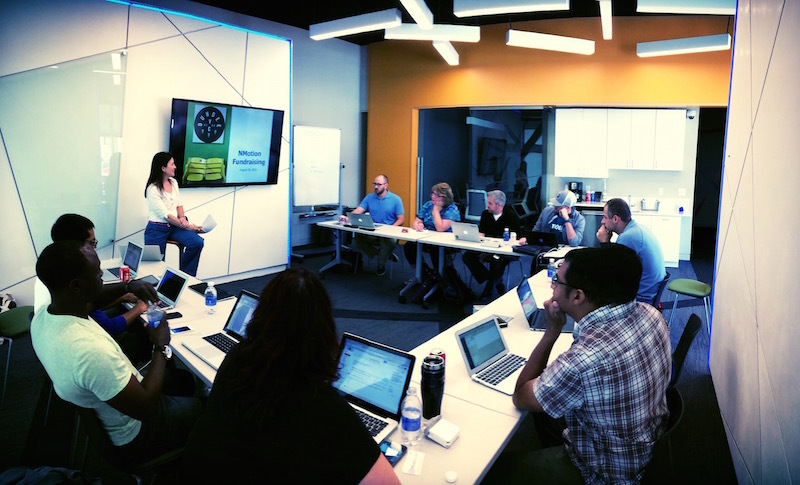 There are over 100 mentors involved in NMotion with a variety of strengths and experience. “We give them a leg up from a company that’s built by two guys in a garage trying to figure it out themselves,” Ardinger says. Lincoln may not be considered a major tech hub (yet), but NMotion attracts talent from across North America due to low costs and a vibrant, dense entrepreneurial community, Ardinger says. “All the startups are within a three or four block radius, so you’re constantly running into fellow founders, developers or folks that are in that space — it’s very easy to connect and network [compared to] some other cities,” he says. About Seamless: Seamless has been in the works for years, says co-director Mike Morin, and the first cohort starts this fall. It seeks startups working on “the Internet of Things,” which Morin says isn’t really about the Internet, nor is it about things, but changing how we interact with everyday items and making them serve us better. His example: a car that communicates with your house, so as you drive home, the home thermostat automatically adjusts to the right temperature. “It’s about offloading a lot of things that people are doing every day that can be automated by connectivity,” he says. Seamless looks for companies going beyond gadgets and working toward smart environments, Morin says. He says that Grand Rapids is ideal for this mission, not just because of low cost of living, but because it’s headquarters for many manufacturers of common home, car and office items (including Whirlpool, Bissell and Meijer). The city also has a unique health care system ideal for entrepreneurs experimenting in that space. 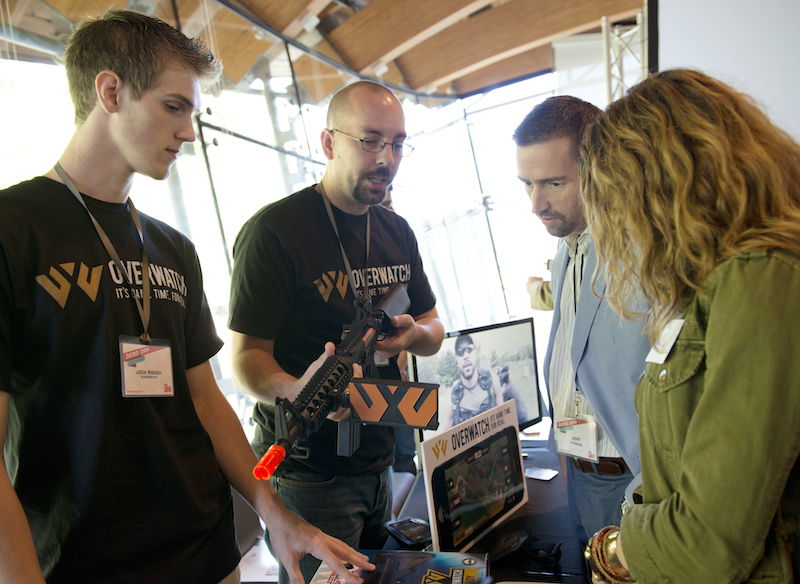 Josh Moody and Michael Paladino, cofounders of Overwatch, showcase interactive gaming technology at Demo Day. Photo via Meredith Mashburn Photography. About the ARK Challenge: The ARK Challenge launched in March 2012 as a collaborative effort between the University of Arkansas, nonprofit Winrock International and NorthWest Arkansas Community College with a federal grant. It aims to advance the region’s competitiveness while helping entrepreneurs of market-validated technologies leverage the area’s resources, says director Collins. Arkansas is convenient to corporate flagships like Wal-Mart and its network of thousands of retail and consumer packaged goods suppliers, Collins explains. Additionally, “we provide a rich, nurturing environment for startup companies and small businesses looking to connect with the top minds and decision makers within these core industries,” she says. The ARK Challenge offers a fall and spring program, and cohorts typically consist of five companies, though up to 15 are sometimes selected. Participants benefit from the expertise of over 50 mentors from across the world. “Whether the companies are looking to pilot new technology, hire key personnel, raise additional capital, gain significant customers, land strategic partners, or most likely all of the above, we work furiously to support their efforts through networking, pitch coaching and more,” Collins says. Emily Starbuck Crone is a staff writer covering personal finance for NerdWallet. Follow her on Twitter @emstarbuck and on Google+. Contact her at emily.crone@NerdWallet.com.